What inspires people to invent things especially the inventions that are so obvious once they are created? What inspires people who invent things that are not obvious – like the cell phone, the computer, or the 3D printer? Can the curiosity and dogged determination of many of the inventors featured in Inventology be taught to others? 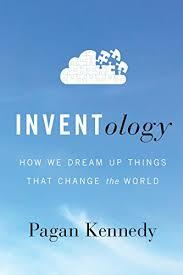 The stories of inventions and inventors – magnificent and simple – are featured in Inventology: How we dream up things that change the word by Pagan Kennedy. I highly recommend this book. I was hipped to Inventology at one of the regular author conversations Joyce Linehan hosts at Ashmonticello in Dorchester. I probably wouldn’t have known about Inventology if I hadn’t attended. Kennedy covers a lot of ground I this book, including sharing a great definition of invention in the intro: “Invention , according to Fry (Art Fry, inventor of the Post-It Note), is what happens when you translate a thought into a thing.” She also distinguishes between invention and innovation. I was turned on by the back-stories of inventions – some made for profit, some made to solve a problem an individual had observed, some inspired by science fiction, and some the result of a happy accident or an inspired moment. Many inventions in today’s internet-connected world are shared openly, innovated by many people, crowdfunded, and made available to the masses. To find the answer to this you’ll have to read the book. Another gem in Inventology was learning about the torture inveterate inventor and optimist Genrich Altshuller endured under Stalin’s regime and the incredible creativity he used to withstand the torture. Altshuller believed that people could be trained to have creative minds and traveled teaching others how to do so and has disciples and progeny around the world. One of the take-aways is not to discount an idea, no matter how small and that, as always when significant things are achieved, determination and consistent effort matter most. Inventology reinforces the importance of children having time/space/tools to tinker and make things outside of traditional classrooms to allow them to develop problem-solving and creativity. They will become the technical explorers that will solve many of the world’s problems if we unharness their enthusiasm and fresh eyes. “HOW WE DREAM UP THINGS THAT CHANGE THE WORLD”….how apropos is this statement in describing YOU. Candelaria dearest you are one of “THE ONES” who make folks feel that they can “dream up things that change the world”…how magnificent a spiritual invention are “YOU”. Maya Angelou said “I’ve learned that….people will forget what you said…people will forget what you did…but people will never forget how you made them feel.”..YOU, my dear, make folks FEEL that they can dream up things that change the world. I personally can attest to the miracle of the inspirational and the challenging of us to do Candelaria. Aw, shucks. Thanks Helen for saying such lovely things about me and for taking the time to read and comment about this post. Not a book I would intentionally pick up but looking forward to reading it. If you get around to it, you will enjoy. I have fallen in love with non-fiction in the last decade or so. I used to strictly read fiction and poetry. Wow! This is heavy & so far out of my realm of thinking! And yet – the book recommendation appeals to my curiosity and my desire to glimpse into other people’s thinking processes. Thank you, Candelaria. I’ll add Inventology to my long list of books-to-read! I am glad this post piqued your curiosity. If you get around to it, you will enjoy. Thanks for posting. ← No One Comes from Nothing _ Stop Saying This!